Rabbits belong in the house, like a dog or a cat, not in hutches. It is no longer considered acceptable to keep a rabbit in an outside hutch. It is a boring, sad and dangerous life. Think how your dog or cat would feel in an outdoor hutch 24/7. A rabbit feels the same way. 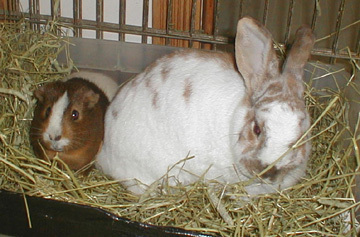 House rabbits can be litter trained and can have free roam of most of the house, just like a dog or cat. A constantly caged rabbit is not a happy rabbit. My rabbits have free range of my house, except for a couple of rooms, like the computer room, which has lots of wires. It is necessary to put tubing around your wires, and have some of your important things out of reach, in the rooms they are allowed in, as house rabbits are extremely curious and will get into alot of your things. 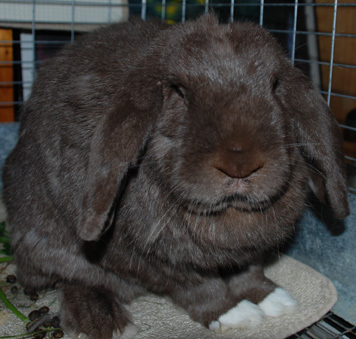 A cage may be necessary if you are introducing a new bunny, as the new bunny will feel very insecure and a cage can be her "safe area." After a while, as the new bunny explores and gets more comfortable with her new home, she will not go into the cage much anymore. I always leave the door open when I use a cage. 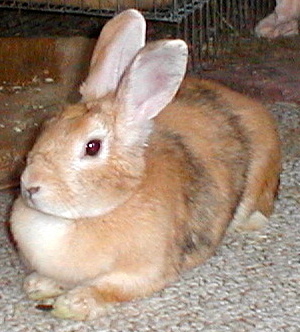 Some people cage their housemate rabbits when they are not home and let them loose when they are home to monitor. That is fine, as long as your bunny gets lots of OUT time, or the cage is VERY large. My rabbits have free range of the house, but while I'm away, the door is closed to a few important rooms, so they only have the dining room, kitchen, hallway, the bird room and upstairs bedroom. The living room is off-limits when I am not home, and this room is where I keep a new bunny when I'm introducing her. My rabbits have an area in the kitchen, where I keep their water bowls and bottle and two litter boxes filled with hay. I also feed them there. The section is lined with a large piece of cardboard for any accidents or spills. Bunnies like to pee and poo as they eat (I mean, who doesn't???). So I find the best way to litter train them is to get a large plastic bin, larger than a cat litter box, with lower sides (like an under-the-bed storage sweater box), line it with newspaper, then add a lot of timothy hay with more on one side of the box. Your bunny will jump in to eat the hay, and poo and pee during eating. If you keep the hay off to one side of the plastic box, then she will be less likely to soil it. I change this box every day. Fresh newspaper and fresh hay. As you get to know your bunnies' habits, you can adjust how often and when by your schedule and theirs. The main food for bunnies of all ages is timothy hay. You can buy a big bale of hay at any Agway-type store, or at a local sanctuary. Timothy hay should be in their litter box and available at ALL times. So should fresh water, either by a water bottle hung up on or in a cage, or in a bowl (preferably one they can't knock over). Greens are also a part of a healthy bunny diet. Dandelions and parsley are two favorites, but you can also give them all the different lettuces you can find (except iceberg), herbs, clover, etc. If you have a yard, you might want to stop weeding or killing any weeds, as most of them are wonderful food for bunnies. Some things in my yard I give them in the summer are: raspberry leaves, clover, grass, plantain leaves, basil leaves, and many more. The following that grow in my yard are POISONOUS and should never be fed to rabbits: buttercup, butterfly weed, lily of the valley. If you are unsure of the greens you find in your yard, you need to make sure it is okay to feed it to them. 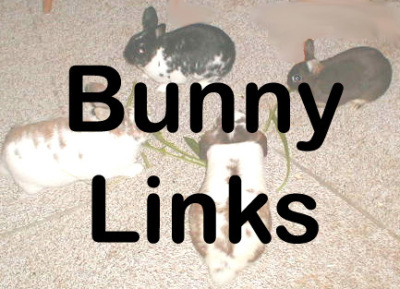 Click here for a list of plants and greens that are okay to feed rabbits. And when in doubt, throw it out - don't feed it to your bunnies. My rabbits start everyday with a handful of dandelions, parsley and a small amount of kale or carrot tops. This is an EVERYDAY food. And of course, they have unlimited timothy hay in their litter boxes. Rabbit pellets are another food, but there are mixed theories about it. Some people believe in a small amount (1/4 cup per day per rabbit), and some believe none at all. 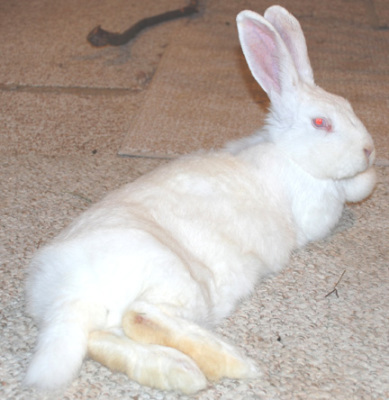 One thing is sure: RABBITS DO NOT LIVE ON PELLETS ALONE, so if you choose to feed them pellets in addition, then get a HIGH QUALITY pellet (Sweet Meadow Farm and Oxbow make an all-timothy pellet), and don't make that their only food source. I feed my rabbits pellets a small amount every evening, mostly when I'm going to sit down and eat dinner, so they leave me alone and I don't have to share my dinner with them. My rabbits also get treats before I leave for work every day. I chop up some carrots, banana, banana peel, and apple (or some other fruits) and give them a very small plate. Too much is not good, but a small amount does make them DANCE!! Toys are an important part of bunnies full lives. You can purchase toys at any pet supply store or online at various places (see supplies links page), but there is no guarantee that they will like what you pick out. 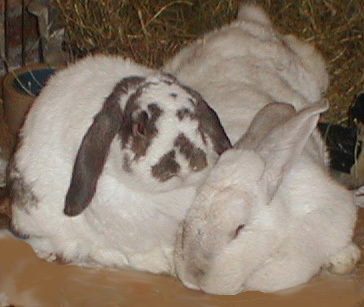 Like all people and animals, different rabbits have different preferences. What one bunny likes is not necessarily what ALL bunnies will like. Bunnies usually find their own toys and as you get to know your bunny you will start saving toilet paper and paper towel rolls, or tissue boxes (remove plastic), or a cardboard box. I have wicker baskets, empty cardboard tubes, and paper ream box tops. Seems to me, ALL bunnies love those box tops that you get 10 reams of paper in. They love to sit in them and chew the edges. I usually line the bottom with newspapers so they can rip them up also. They have a blast. Always have your rabbit spayed or neutered. Rabbits are overflowing in the shelters. Please don't breed or buy while shelter animals die.